You know that Spring has arrived when you hear the sound of lawnmowers throughout the neighborhood. Most weekend mornings you’ll see your neighbors pushing their mowers in an effort to keep their yards looking manicured. If you ask them, most would jump at the chance to find a way to get the job done without all the time and sweat effort required. 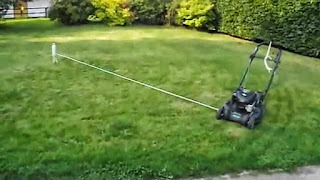 It seems like the Great American Pastime of cutting the grass was a tradition that many of us remember dreading as we grew old enough to push the mower. Whoever invented the riding mower was surely a hero to long suffering homeowners who didn’t have kids or anyone to “inherit” the weekly chore. Now, technology has come to the rescue once again. Good news weekend yard warriors! Instead of coming up with “creative” ways to mow remotely, a trip to the store might be all the effort you need. It looks like there may be a new product coming to a lawn care center near you that will free you from some of the hassles if getting the perfect looking lawn. The FCC has recently given the green light to iRobot Corporation, the makers of the Roomba robotic vacuum cleaner, to make and sell a robotic lawnmower. The robotic mowers have already been in use in Europe in recent years. Most use some sort of underground fence or other system to keep the mower in the proper area. The one approved for iRobot seems to have a different system that uses wireless stakes in the ground to direct it within the boundaries. The beacon design will allow it to operate but not interfere with signals of other devices using the same frequency. Brendan Spaar enjoys working in his yard so the robotic mower won’t be his next tech purchase. Using the regular mower will allow Brendan to keep his lawn and wallet looking good. However, he might suggest it to his neighbor who keeps mowing over the cord of his electric mower.